Dated? Yes. Good value? Absolutely. If you've got a 4K TV, you'll want a 4K-upscaler, and the BDT270 issues pin-sharp upscaled Blu-ray discs without a fuss. With Ultra HD Blu-ray just months away, this nicely priced deck fills a gap without breaking the bank. With Ultra HD Blu-ray just months away, shouldn't those with Ultra HD 4K TVs sit tight? Patience could pay dividends, but aside from the little matter of 3D and 4K, the search is on for a last-gen Blu-ray player that can upscale to 3840 x 2160 pixels without breaking the bank. That's exactly what the Panasonic DMP-BDT270 is attempting. 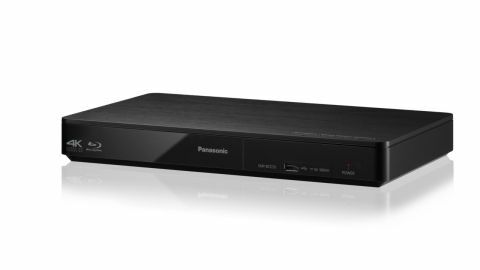 Selling for £99 (US$120, AU$152), it packs 4K upscaling, 2D and 3D disc playback, digital file support and a dual core processor into a surprisingly small and low-priced product. Measuring just 43 x 312 x 180mm, the BDT270 has a mirrored black frontage and a metallic roof, with decent build quality. It's half the size of a Blu-ray player from only a couple of years ago, and sits easily on an AV rack. Some basic navigation buttons are included on the top, while the front houses a single USB slot for either feeding media or recharging 3D specs. On the rear are the mere basics: an HDMI output and an Ethernet LAN slot for wired networking, though the BDT270 also has WiFi and, for Android users, Miracast connectivity. There is also support for Dolby Digital, Dolby Digital Plus, Dolby TrueHD and DTS-HD soundtracks. In short, the BDT270 does just about everything short of offering analogue audio outputs. What is most striking about the BDT270 is both how old fashioned its user interface looks, and how much it ignores Blu-ray. Video, Music, Photos and Network (clunky language for smart TV apps) are arranged around a central Setup option, with the remote control's directional keypad all that's needed to navigate. It's quick, it's simple, but it's in need of a fresh design. Also showing the march of time is the BDT270's smart TV dimensions, which amounts to little more than a Netflix button on the remote control and a separate hubscreen of apps. The latter used to be called VieraCast, and it still should be for nothing has changed. Apps on the first page include the BBC iPlayer, BBC Sport, Netflix, BBC News, Amazon Instant Video, YouTube and an advert for Panasonic Viera TVs. The icons for these apps are massive, colourful and very easily to skip through. In the centre of the screen is a live video window, which continues to play whatever you're watching while you navigate apps. Skip to further pages of VieraCast and the choice of apps drops off immediately. Page two contains Dailymotion, Euronews, CNBC Real-Time, PlayJam Games and a setup page. There are even blank app-gaps here, though it's easy enough to bring forward apps lost in the third and fourth pages, including Facebook, Twitter, SHOUTcast Radio and a web browser. On most pages there's also a link to visit the Panasonic marketplace, which gives you access to more apps (TuneIn, Deezer, CineTrailer, Aupeo), though the shopping area – where Panasonic used to sell 3D glasses and accessories – is graced only with a "we regret to inform you" message about its demise. Whether the inclusion of a huge white Netflix shortcut button on the remote is a good or bad thing will depend on your subscriptions, but those who depend on Amazon Instant Video will be slightly frustrated at having to delve far into the BDT270 to launch the app. The remote is otherwise simple, yet functional; it doesn't glow in the dark, but the disc navigation buttons are blue, the directional keypad is well laid out and, best of all, all the buttons are relatively large. The Panasonic remote control department does it again. There are two ways to play a Blu-ray disc from the Home screen; choose video, then choose Disc instead of USB, or just press the Play button on the remote. Simple stuff. The opening sequence of Gravity in 3D (remember that?) is rendered with extreme skill by the BDT270, with the upside-down space shuttle drifting into view with intense realism. Our test screen was a 65-inch 4K TV, on which edges appeared to be upscaled well, with no jaggies visible. I did notice the occasional judder when the astronauts floated quickly by and when the Earth's surface came into sharp focus, though the debris sequence was always comfortable to watch. Colours and contrast were superb throughout. Switching to a 2D version of The Hobbit: The Desolation of Smaug, the level of detail appeared to be even higher on a 3840 x 2160 pixel panel, with the BDT270 upscaling from Full HD to Ultra HD. I was also able to compare a trailer for Marco Polo in Full HD from the BDT270 and from Netflix in 4K on an Ultra HD TV. The former did not compare with the latter for depth and detail, but at no stage did the BDT270's upscaled version look soft. The BDT270 struggled to make a DVD passable on a 65-inch 4K screen, but then the maths is massively against that happening given that DVD's 720 x 480 pixels equals 0.3 megapixels to Ultra HD's 8 megapixels.